There seems to be so so many obstacles for Edinburgh Traders these days, with increased rates, parking restrictions, endless roadworks, the economy as well as the good old Scottish weather, all of which prevent your customers from venturing outdoors and into your shop or place of business. It's a fact that more people are doing their shopping on-line, and admittedly this also accounts for people visiting shops less, but it is also becoming a vital way for businesses to be seen, boost their sales and even to survive. They say the best time to advertise is during a reccession, but usually this means paying hundreds of pounds or more for a one-off advert, which can be a risky as to whether or not it will pay off. This site is different, it isn't just about selling advertising it's about celebrating the unique area you trade from. Creating a useful site that benefits both businesses and customers alike. 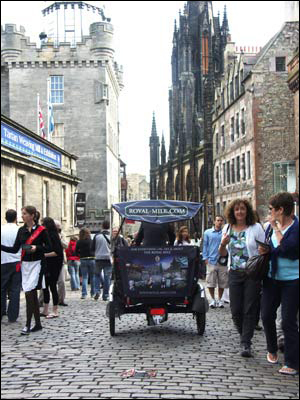 Giving Royal Mile traders the opportunity to advertise their business for a full year (or more) for just £40p/a. Each of our Edinburgh street sites offer advertising exclusively for businesses in each specific area whilst being connected to 18 in total Edinburgh websites. We need local buisnesses to participate, and to encourage this we offer the best value for money advertising anywhere. 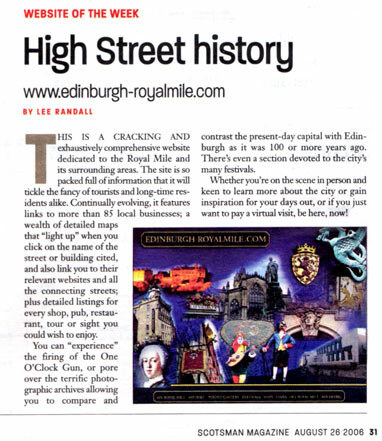 Since launching This site in October 2005 We have been constistently Top in Google and other search engines for 'Royal Mile' and many other common search terms. as part of their National Heritage. Our Edinburgh sites could have been designed especially for the ipad. The big touch icons and scrolling menus are perfect to browse effertlessly through all the Shops, Bars, Restaurants, Businesess and Accommodation. Read about the numerous places of interest, history and people and enlarge the text as required. The Photo Galleries look great and can be viewed in landscape or portrait modes. We have avoided the use of Flash animation which would have been unuseable on the iPad and kept the pages clean, clear and simple and free from adverts, pop ups, bagpipe music and other distracting clutter. 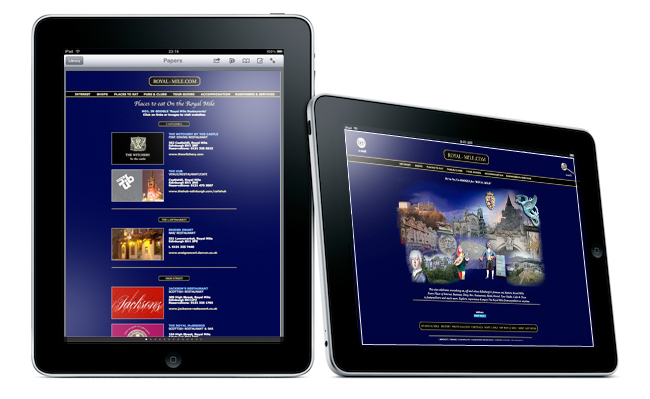 With our Edinburgh sites and the iPad* you have Edinburgh at your fingertips!